The Fashionably-Forward Foodie: KCC Farmer's Market Oct Edition! 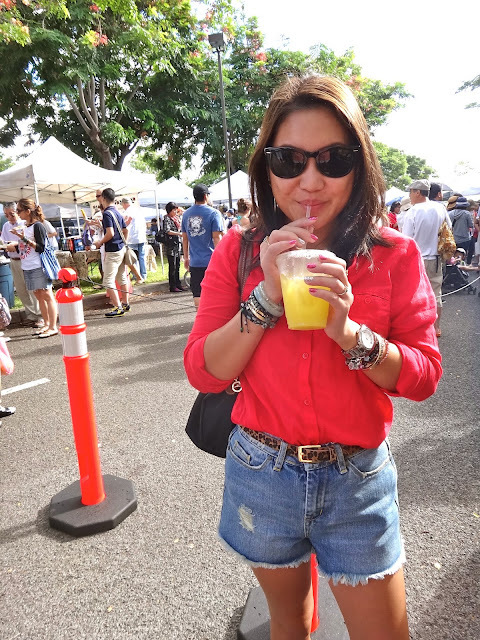 Parents and I ventured out to the KCC Farmer's Market (<-- click on the link to check out my first time there!) last last week Saturday. Having this be my second time there, I've realized a couple of things- (1) Go around 830-9am- that's the perfect time. (2) Park on-site- there is always parking around the above time. No need to find parking on the street or around KCC. (3) The Maui Gold Pineapple slices, juice and smoothies are SO worth every penny. (4) If the Sweet Potato Mochi booth is there, you absolutely must try it. It's one of my most favorite sweets now! (5) If you are going to buy lots of local veggies/fruits, be sure to bring a shoulder bag or cart to lug everything around. It can get heavy! (6) The Juice booth toward the front of the entrance always has the best juices to choose from. (7)The Basil/Tomato/Mozzarella pizza is a must. (8) Bring umbrella if needed! Loaves of bread! Pink (Guava) and Purple (Taro) bread?! Yes, please! 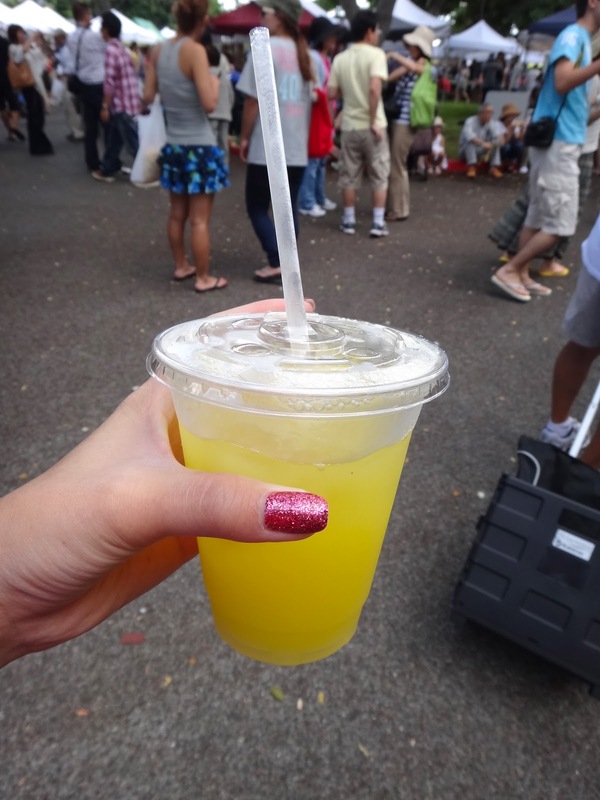 The sweetest, freshest Pineapple Juice. 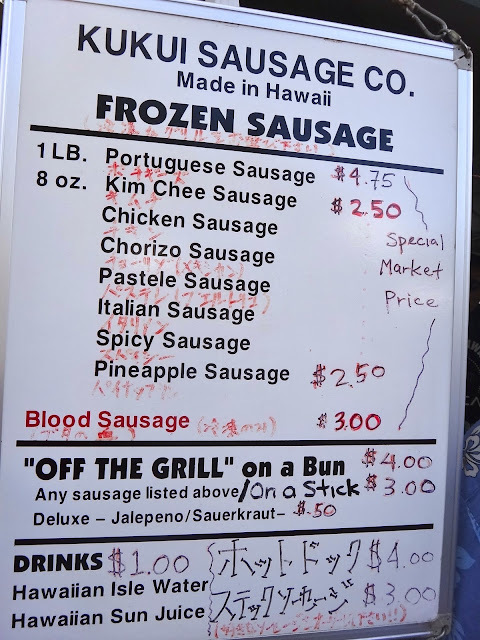 Portuguese Sausage on a stick and Pineapple Juice! The same Mochi booth at Shirokiya that serves Taiyaki too! 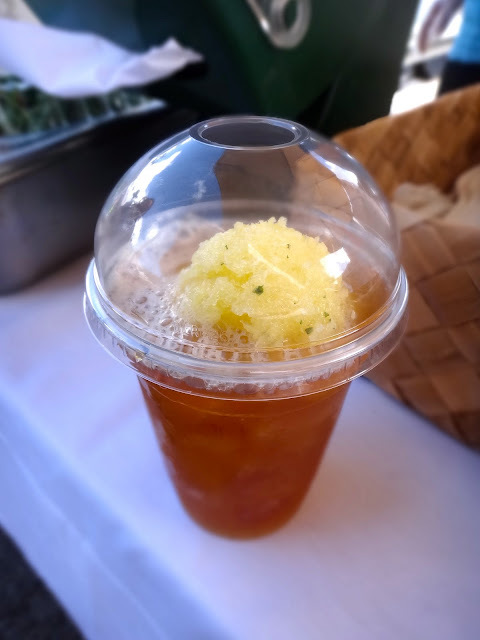 Plantation Iced Tea topped with Pineapple Sorbet!!!!! This booth was one of my favorites! Try their Kalua Chicken and Chicken Long Rice. Plus, they have restaurant-like seating and service! Next time, I want to try their Sake Clams. They ran out as soon as we got there. Boooo! Kalua Chicken on a bun with Kim Chee Cucumbers. The cucumbers were AMAZING. I wish I could've got the recipe! Chicken Long Rice with brown rice!! They also came around with slices of Starfruit! The guy from the French Fries stand gave me the leftover sample fries for FREE! Thank you! Jackfruit. I'm amazed how gigantic they grow to be. $3/lb. "Sweet, crunchy, aromatic fruit." what? sweet potato mochi????? OMg i need to go this weekend. pronto!!!! wait, i'm re-looking at your pics, thye have waaaaAAAaaay better food now! Ahhh! Still never made the effort to go to this. I really need to go.